Indian Ridge Country Club offers an attractive lifestyle for active adults with a zest for life. Active adults who prefer an open-age community may find the home of their dreams in Indian Ridge Country Club. This beautiful development has a prime location in Palm Desert, California, in the heart of the Coachella Valley. Highlights of its resort-style amenities include two golf courses, 14 tennis courts, multiple clubhouses and over 30 outdoor swimming pools. Indian Ridge Country Club was built by Sunrise Development Group between 1993 and 2006. Today, the community features 1,068 homes, including both attached and single-family designs. While it is open to residents of all ages, the community has all the amenities needed to support a healthy, active adult lifestyle. Spread across 640 acres, Indian Ridge County Club features a scenic setting that is within close proximity of many shops, restaurants and local attractions. Walking and biking trails make it easy for residents to explore the community, while 32 outdoor swimming pools let residents enjoy the beautiful California weather. Those with pets can also make use of the Rover's Ridge Dog Park. Resident golfers will love having access to Indian Ridge Country Club's golf facilities. The community includes two private 18-hole golf courses designed by Arnold Palmer. It also provides a driving range, chipping and putting greens, and Arnie's At the Turn Snack Bar. Indian Ridge Country Club is one of Southern California's premier gated country club communities. Beyond golf, multiple clubhouses within Indian Ridge County Club offer an exciting mix of amenities. The 42,000 square-foot main clubhouse features four restaurants, a full-service day spa, card rooms, a library, a TV lounge and a golf pro shop. It also offers space for special-interest group and social club meetings. At the 22,000 square-foot Sports Club, residents can stay in shape with indoor and outdoor amenities. The facility offers a state-of-the-art fitness center with cardiovascular and strength-training equipment, an aerobics studio, a steam room and sauna, and locker rooms. Outdoors, the Sports Club includes two swimming pools and several sports courts. There are 14 lighted tennis courts, four pickleball courts, two lighted croquet lawns, two bocce ball courts and a basketball court. Homes in Indian Ridge Country Club include both attached patio homes and detached single-family designs. Patio homes range in size from 1,527 to 2,368 square feet. They offer two or three bedrooms, two to three-and-a-half bathrooms and a two or two-and-a-half-car garage. Single-family homes were offered in 21 models, ranging in size from 1,948 to over 4,500 square feet. Depending on the style, floor plans may include two to four bedrooms, two to four-and-a-half bathrooms, and a two-and-a-half-car garage. 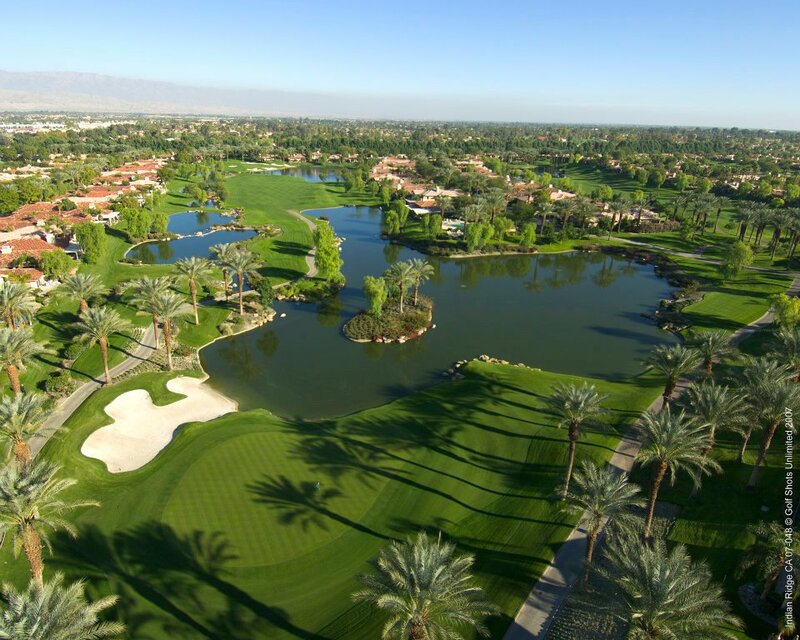 With beautiful homes, exciting amenities and a prime location in the Coachella Valley, Indian Ridge Country Club provides a perfect retreat for active adult retirees.